The following short commentary from the First Letter of Peter, Chapter 2, verses 4-10 is lightly edited with permission of the author, Dr. Daniel Keating, from his book, Catholic Commentary on Sacred Scripture: 1 Peter, 2 Peter, and Jude, published by Baker Academic, 2011. While it was written from a Roman Catholic perspective, the material can be beneficial for Christians from other traditions as well. Dr. Keating explains the aim of his commentary in the introduction to 1 Peter: “The First Letter of Peter is a hidden gem, tucked away among the catholic epistles, just waiting to be discovered. Overshadowed by the longer and weightier letters of Paul, 1 Peter has often been neglected or undervalued. My aim in this commentary is to aid the reader in discovering the riches of this letter, in the hope that he or she may hear its proclamation of the gospel anew and follow the call to suffer joyfully with Christ.” – ed. 1 Peter 2: 4 Come to him, a living stone, rejected by human beings but chosen and precious in the sight of God, 5 and, like living stones, let yourselves be built into a spiritual house to be a holy priesthood to offer spiritual sacrifices acceptable to God through Jesus Christ. 6 For it says in scripture: “Behold, I am laying a stone in Zion, a cornerstone, chosen and precious, and whoever believes in it shall not be put to shame.” 7 Therefore, its value is for you who have faith, but for those without faith: “The stone which the builders rejected has become the cornerstone,”8 and “A stone that will make people stumble, and a rock that will make them fall.” They stumble by disobeying the word, as is their destiny. vs.4-5: In these two verses Paul used the image of a house, or temple, made of stones. Echoing Psalm 34, Peter calls us to come to him,23 to Jesus himself, a living stone, rejected by human beings but chosen and precious in the sight of God. This phrase is drawn from two Old Testament texts: Psalm 118:22 and Isaiah 28:16 (Peter will quote both texts below in vv. 6–8). Jesus is the “stone” that the Father has given to serve as the foundation of God’s own house.24 Though rejected by the Jewish leaders of his day, he is raised up and put in place as the foundation of the Church. He is a “living” stone because, though rejected and cut off in death, he has been raised from the dead and now lives. 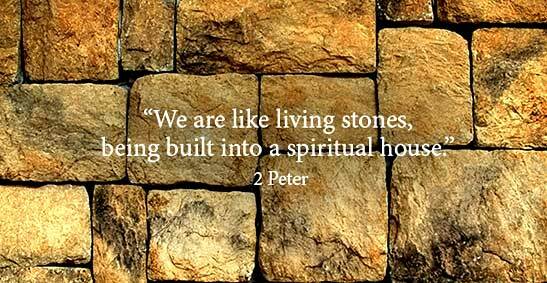 Strikingly, Peter now applies the imagery of “stones” directly to the Christian people. We are to be like living stones who let themselves be built into a spiritual house. The image of a “house” predominates here, both as a noun (oikos), but also as embedded in the verb “to be built into” (oikodomeo). This is no ordinary house made of lifeless stones but the true spiritual temple of God that has living members, with Christ himself the cornerstone of the temple (see Ephesians 2:19–22). In the Old Testament the temple in Jerusalem is often simply called the house of God (see sidebar below, “The Temple as God’s House”). It was the dwelling place of God among his people. We the Christian people have now become the dwelling place of God; we are living stones built together “into a dwelling place of God in the Spirit” (Ephesians 2:22). More than this, we are called to serve in this house as a holy priesthood. Here the imagery slides from that of the building to those who serve in that building. A priest is one ordained to serve in God’s temple. He offers sacrifices and brings the prayers and needs of the people before the Lord. What then does Peter mean by calling the Church a “holy priesthood” called to offer spiritual sacrifices acceptable to God through Jesus Christ? He does not develop the practical implications here, but we should note that he is not referring specifically to the ordained priesthood. Rather, it is the entire Christian people by virtue of their baptism into Christ who have entered into the inheritance given to the people of Israel to be a “royal priesthood” (v. 9; Exodus 19:6). We are all called to stand before the Lord as priests, offering our lives as living sacrifices. We should not overlook the repetition of “spiritual” in verse 5.25 We have now become a “spiritual house” and a priesthood offering “spiritual sacrifices.” “Spiritual” does not mean immaterial or unreal. Rather, “spiritual” refers to the divine life and activity of the Holy Spirit in and through us. We are now the house where God’s Spirit dwells and we offer our lives as sacrifices in the power of the Spirit. vv. 6–8: To support his point Peter ties together three Old Testament texts that concern a “stone” in God’s plan.26 The first (v. 6) is from Isaiah 28:16, where the Lord God reprimands those who put their trust in other gods and promises that he himself will establish among his people a cornerstone, chosen and precious to him, such that whoever believes in it shall not be put to shame. The second (v. 7) is an exact quotation of Psalm 118:22: The stone which the builders rejected has become the cornerstone. Here, the psalmist rebukes those who reject the “stone” that the Lord himself is establishing as the cornerstone of his own house. The third (v. 8) is a loose adaptation of Isaiah 8:14, in which the prophet chides both houses of Israel for failing to believe the Lord who will become for these faithless ones a stone that will make people stumble, and a rock that will make them fall. Peter shows that Jesus is the “stone” promised in the Scriptures, rejected by the leaders of Israel who put him to death (see Acts 4:10–11) but raised to life to become the cornerstone of God’s house. The key issue is faith. For those who have faith, the stone established by the Father is “precious,” but to those without faith, this stone becomes a cause of stumbling and falling. What does it mean to stumble in this context? They stumble by disobeying the word, that is, they do not believe and obey the gospel (note the contrast with “obedience to the truth” in 1:22). What should we make of Peter’s claim that this stumbling over the stone in unbelief was their destiny? Were they personally fated by God to disbelieve and disobey the gospel of Christ? Some have interpreted Peter this way, but this is not the conclusion Peter is drawing here. Rather, he is showing that the Scriptures predicted ahead of time that Jesus, the stone established by the Father, would be a cause of division and that some would not obey his word. The biblical prediction does not rob anyone of free will. Instead, it gives confidence to believers that the ongoing rejection of Jesus by some was foreknown and foretold by God and so falls within his plan and purpose for the salvation of the world. Once his kingdom was secure, David consulted the prophet Nathan about building a house for the Lord God to dwell in, and Nathan gave his blessing (2 Samuel 7:1–16). But the Lord interrupted this plan, telling David through Nathan that he had no need of a house to dwell in. Instead, the Lord turned the tables on David and promised that he would build a house for David, meaning a dynasty of kings. The Lord also promised that David’s “offspring” would build the house of the Lord, and this was fulfilled by David’s son, Solomon. The glorious temple that Solomon built (see 1 Kings 5–8) was the focal point for Israel’s life, worship, and sacrifice. Destroyed by the Babylonian armies in 587 BC, the temple was rebuilt by the returning exiles (see Ezra 3). Enlarged by King Herod the Great (37–4 BC), the temple in Jerusalem stood as one of the wonders of the ancient world. Jesus not only said that he was greater than the temple (Matthew 12:6), but he also claimed that he himself was the temple of the living God (John 2:19–21). He is now the dwelling place of God on earth, and, as living stones built into him, we have now become God’s house where he dwells through the Spirit. 1 Peter 2: 9 But you are “a chosen race, a royal priesthood, a holy nation, a people of his own, so that you may announce the praises” of him who called you out of darkness into his wonderful light. 10 Once you were “no people” but now you are God’s people; you “had not received mercy” but now you have received mercy. vs.9:We have now come to the climax of this passage. Peter’s main concern is not, in fact, with those who disobey (v. 8) but with the glorious privilege of those who have believed in the “living stone” established by the Father. He announces that believers in Christ have become a chosen race, a royal priesthood, a holy nation, a people of his own. The four phrases build upon one another with powerful effect and together communicate the staggering dignity that is ours in Christ. The language is not Peter’s own invention. He has selected and combined phrases from the Greek version of Isa 43:20–21 and Exod 19:6.27 By linking these texts, Peter brings to mind the two great moments of deliverance in Israel’s history: the deliverance from slavery in Egypt (Exod 19) and the deliverance from exile in Babylon (Isa 43). Peter is saying that what Israel was and is called to be has now been fulfilled in the Church through the deliverance Christ has accomplished. All the terms point to a corporate reality. We have become a “race,” a “nation,” and a “people,” specially chosen by God for his own possession, to be holy as he is holy. And this race, nation, and people is also a royal priesthood. By virtue of our incorporation into Christ, we have attained a truly kingly and priestly status not as separate individuals but as a people, the Church. Moreover, our royal priesthood obliges us to evangelize: we are to announce the praises of him who called us out of darkness into his wonderful light. The Greek word translated “praises” is literally “virtues” and comes directly from Isa 43:21.28 Though the term “virtues” usually refers to good moral qualities, here it refers to the saving acts of God. As the people of God, we are called to announce God’s great deeds by giving testimony to what he has done for us. The contrast between light and darkness depicts the conversion that ought to accompany baptism: we come out of the darkness of our former way of life into the light of Christ. Here it is helpful to call to mind the mission of the servant of the Lord in Isa 42:6–7. He was called to be a “covenant to the people,” a “light to the nations” (NRSV), and to free from prison those who “live in darkness.” Jesus has done this through the New Covenant, bringing both Jew and Gentile into the full inheritance promised to Israel. This is what we are called to make known in the world—and when we do so, we are giving God praise. If all this is true—that each of us has been called to be a member of a “royal priesthood” and a “holy nation”—then each of us is also called to participate in the mission of this priesthood and nation to the whole world. We are God’s “own possession” not simply for our own sakes. We are also called to “announce the praises of him who called us out of darkness into his wonderful light.” Each of us needs to know and experience the freshness of the gospel and to experience wonder at being called into God’s marvelous light. Not many of us are called to preach to large multitudes, but all of us are capable of giving personal testimony to the great deeds that God has worked in our own lives. 24 Jesus applies Ps 118:22 to himself in the Gospels (Matt 21:42; Mark 12:10; Luke 20:17). 25 The Greek word translated “spiritual” here (pneumatikos) is different than the one translated “spiritual” in verse 2 (logikos). 26 The Old Testament “stone” texts singly or in combination are used in a similar way by Jesus himself (Matt 21:42; Mark 12:10–11; Luke 20:17–18), by Paul (Rom 9:32–33; Eph 2:20), and by Peter in Acts (4:11). 28 “Virtue” is an unusual translation of the Hebrew “praise,” found only in a few texts in the latter part of Isaiah and once in Habakkuk and Zechariah (Isa 42:8, 12; 43:21; 63:7; Hab 3:3; Zech 6:13). Dr. Daniel A. Keating (Doctor of Philosophy, University of Oxford) is associate professor of theology at Sacred Heart Major Seminary in Detroit, Michigan, USA and an elder of The Servants of the Word, a lay missionary brotherhood of men living single for the Lord.